I don't know if I can put together words for it. The animation is both intense and stagnant, the imagery both beautiful and horrifying. I've been watching anime for over 15 years now, and there is no anime like Mononoke. I would compare the main character, The Medicine Seller, to Mushishi's main character Ginko, but the worlds they inhibit and mysteries they entangle are rather different...flavors. Where Mushishi give you a subtle but deep emotional type of chill, Mononoke bares its teeth and leaves you shaking in your seat. You like voice actors? Even if you don't, I can't imagine anyone not enjoying The Medicine Seller's dialogue, provided by veteran Sakurai Takahiro (Cloud in Final Fantasy: Advent Children, Polar Bear in Polar Bear Cafe, Ja'far in Magi). If you enjoy Mononoke, be sure to check out The Medicine Seller's first story that started the series, "Ayakashi Samurai Tales: Bakeneko". "Mononoke" is a very unusual series. It's supernatural horror, and uses a unique cinematic style (surreal colors, disjointed camera angles) to evoke feelings of unease in the viewer. 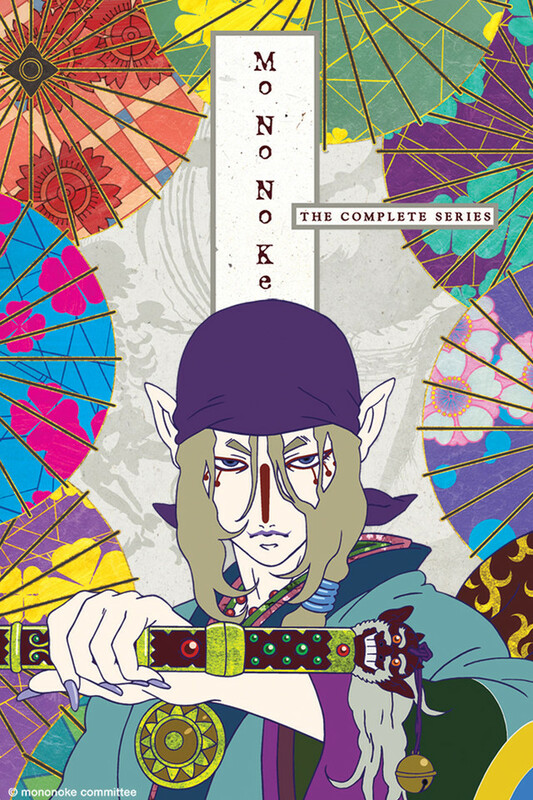 The series is presented in several separate arcs, each centering around a "mononoke", a spirit of karmic vengeance, and its defeat by the nameless main character. It's unusual for its artistic style, thoughtful treatment of issues of class/gender in premodern Japan (prostitution, arranged marriages, women trying to enter the workforce), and for its ability to create suspense and mystery through excellent pacing. I rewatch this series every year, and every year I find something new. If you like Mushi-shi, you might like the story. If you like Gankutsuou, you might like the artwork. If you like pre-modern Japanese aesthetics, you'll probably like it. If you're expecting monster-of-the-week demonslayer shounen, this is probably not for you. Yes! It's here on Crunchy! Mononoke is a series based off of the 2nd episode of another show called Ayakashi that got extremely famous. The series follows a medicine seller through time and space, hunting mononoke. The series is accented by vibrant artwork based off of oriental-like patterned fabrics. The medicine teller weaves through mystery and the depths of human sins to uncover the truth, form, and reason of the mononoke. This is an example of fantastic storytelling. Its weird and beautiful, but what really got me was how complex the stories were and how much they sucked me in. This is one I will be rematching many times and will be added to my top five favorite anime of all time. Each story is thought-provoking and leaves the viewer trying to piece together what happened long after you've finished the episode. I would say that "Mononoke" is like reading a beautiful, classic novel as opposed to reading a fun-filled, YA story. It's not that I'm saying one is better than the other, it's just that they are completely different styles of story-telling. Filled with symbolism and grace, this show manages to be perplexing and satisfying at the same time. However, the one problem that I had is that the main character, the Medicine Seller, can be unsettling. You never really know his motives, so you never quite trust him. Beautiful and disturbing art, wonderful voice acting, and a compelling lead character make this my favorite anime this winter. Even if the stories creep you out or leave you cold, the art is sumptuous and rather crazed. By the way, the music is also quite good. It has been mentioned in other reviews - if you are a fan of the art in "Gankutsuou: The Count of Monte Cristo", you'll be delighted by this series. Also a nod to "Mushi-shi", but different in tone and intent. This title is a spin off from the Japanese Horror stories and was my favorite segment. I loved this series for its uniqueness, style , strangeness and beautiful animation. Sakurai san is perfect as the medicne man whose character that is clouded with mistery.I have collected the dvd of this series when it was first released. I am happy that CR has this title and officially released it for new viewers to discover. A lot of philosophical undertones in this show.. Makes you think. Also, the art style has to be one of my favorites out of all the anime I have seen. I love it. The character design is also quite intriguing. I would highly recommend this show to anyone who likes mystical/paranormal/metaphorical/spiritual subjects/concepts. I've realized after watching some of the episodes, the subs aren't quite what I am used to.. But I think the message is still brought over pretty well. I loved this anime I hold no reservations in recommending it to anyone. It has this unique and beautiful animation style, reminiscent of ancient Japanese paintings. The storyline is eerie, creepy, at times disturbing. This anime needs to be watched. This show has brought unique, truly Japanese ghost stories to life in an amazing visual way. The simple make a bigger impact than most other highly rendered anime. It must be experienced. If you call yourself a fan of the anime art form, watch this.